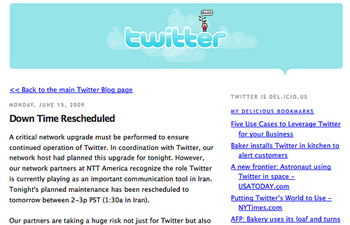 Twitter announces that it rescheduled its maintenance time. The U.S. State Department asked the service to delay its downtime to allow information to continue flowing out of Iran. There’s been much ado about Twitter’s role in the political protests in Iran, and for good reason. With the Iranian government expelling foreign journalists, outlets like CNN scrambled to uncover sources where they could. They found these sources among the din of unverifiable messages surfacing on Twitter. It’s been fun reading mainstream media accounts of how Twitter is, in a sense, revolutionizing revolutions — very “meta,” no? If you aren’t familiar with these recent events, MediaShift editor Mark Glaser has a very useful summary here. But I’ve been more interested in the way this story has brought Twitter into the mainstream. That is, not Twitter’s effect on the Iranian protests, but the protests’ effect on Twitter. If the mainstream news media can't get over its impulse to hype their shiny new tool, they will be enfeebled by the same kind of navel-gazing I thought Twitter was all about." I have a confession: I’ve made a good chunk of my living recently counseling clients on digital media strategies, yet I myself have abstained from jumping aboard the Twitter bandwagon until this past week. Sure, I’ve launched Twitter campaigns on behalf of clients and I do consider myself wise in the ways of microblogging best practices. But while I understood how organizations could use this channel to connect with certain audiences, I felt that, for personal correspondence, Twitter had a sort of a navel-gazing, quasi-exhibitionist feel about it. If something’s worth sharing with a larger group, isn’t it worth more than 140 characters? Besides, I was — and continue to be — a stickler for good grammar, so the idea of proudly publishing that SMS-style nouveau scrawl makes me nauseous. 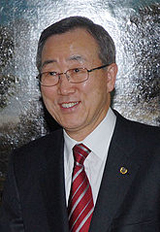 UN Secretary-General Ban Ki-moon has begun tweeting. My friend Laura Fitton (who authored the just-released Twitter for Dummies”) has been hassling me for quite a while to sign up, but I’ve been stubborn. Nevertheless, the Western media’s reliance on Twitter as a primary source — along with the technology’s power to enable dissent in an otherwise stifling environment — has inspired me to climb aboard. Twitter was scheduled to go offline for routine maintenance last week, but the U.S. State Department requested that the service keep the information flow from Iran uninterrupted. If the continuous operation of Twitter is deemed important to our national interest, perhaps there’s something to this. Perhaps I should stop being so self-conscious about using such a self-conscious communications tool. It’s not just the State Department that’s giving a nod to Twitter in the wake of the protests. The United Nations is adding its voice, too. I’ve been talking lately with my friend Jim Landale, a public information officer at the UN. Landale’s been working on a multiplatform campaign to mark the 100 day countdown to the UN’s International Day of Peace. The campaign, called WMD: We Must Disarm, is jettisoning traditional promotional tools in favor of social networks in an effort to reach a “socially active audience.” (You can follow the campaign on Twitter here). This is obviously the first time that a Secretary-General of the United Nations has ‘tweeted’ and the first time (that we know about) that one of our campaigns has used multiple online platforms at once…There was some skepticism initially within the UN Headquarters at the idea of using Twitter, Facebook and MySpace for such an important campaign, rather than the traditional set of promotional tools, but we managed to overcome this by demonstrating how the campaign would work online…In addition, although we planned the campaign well ahead of the recent elections in Iran, the role Twitter has played in the demonstrations has also probably helped persuade doubters within our own ranks that Twitter and other social networking sites can be an extremely powerful tool. If they Twittered and live-blogged the French Revolution, it still would have been the French Revolution: ‘this aft 3pm @ the bastille.’ It all still would have happened, perhaps with marginally greater support…The interesting question is what technology would have done after the Revolution, during the Terror. What would word of the demonic violence, the tumbrels and non-stop guillotines unleashed circa 1790-95 have done to French support for the Revolution, and world support? Would Thomas Jefferson have been able to continue his blithe indifference if reports of France grimly murdering France had been Twittered out each day? The answer, of course, is “no.” And the point, of course, is that Twitter can enrich the newsgathering ability of the mainstream media by acting as an investigative tool, a harbinger of public sentiment , and/or a crowdsourcing device. But Twitter itself is not — and should not be — the story here (except for outlets like this that cover this beat). Instead, it’s part of the storytelling apparatus. It’s no longer a grand phenomenon, but is instead a mere fragment of the mainstream media’s new configuration. 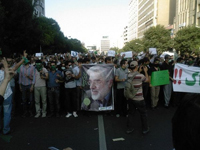 Journalists should use Twitter to better understand the Iranian rebellion, not use the Iranian rebellion to tout a “Twitter Revolution.” By focusing too heavily — and headily — on a simple micro-blogging technology, the news media risk distracting themselves from the more macroscopic, geopolitical issues at play here. If the mainstream news media can’t get over its impulse to hype their shiny new tool, they will be enfeebled by the same kind of navel-gazing I thought Twitter was all about…until now. Iran protest photo collected but not taken by Misterarasmus via Flickr.